In Lent 2019 Rideau Park people are invited to think about the spirituality of disciples, anchored by the phrase: “I have enough. I am enough.” Lent is one time of year when we reflect on how we might live more faithfully in the world. In our consumer society, when we are pressured to have more and buy more, a Christian alternative is learning to live with less, and being faithful in how we dispose of things we no longer need. 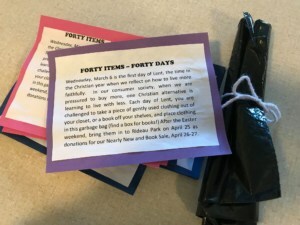 In the “Forty Items – Forty Days” challenge, we are invited to take a piece of clothing out of our closets, or a book off our shelves, and put them aside for re-use or re-cycle. After the Easter weekend, the items are dropped off at Rideau Park for the Nearly New (clothes) and Book Sale. At Rideau Park’s annual Christmas Bazaar in November 2018, Christy Harris, a very innovative and socially responsible member of our congregation, sold 80 mesh produce bags she made herself. 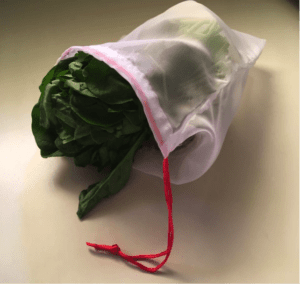 These are easily washed and reusable bags to use at the grocery store in the produce aisle. 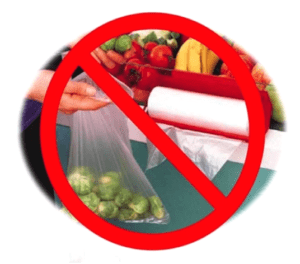 No more single-use plastic bags! Stop wasting! Start saving! Help reduce the amount of plastic that ends up in our landfill and oceans. 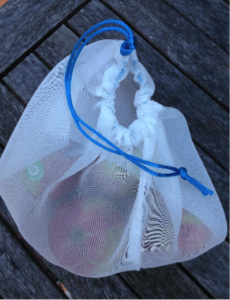 Reusable mesh bags are easy care! Wash gentle cycle, or hand wash and air dry. Keep them handy in your large, reusable grocery bags. To spread the word, and take up the challenge, please visit YouTube and watch any of their simple ‘how to’ videos on how to make your own produce bags (check out Fairyland Cottage or Crafti Patti) or places to buy ready-made bags (NuGrocery on Wellington at McCormick or Terra20, also on Wellington or at the strip mall beside IKEA on Pinecrest). Post your stories and experiences on Facebook on your own page and the Rideau Park United Church group page. (Join us if you haven’t already) Watch this page for updates! What kind of positive environmental impact can we make together?